Most countries have seen their prosperity rise over the past decade, but their contributions to global prosperity have been very uneven. That the biggest gains have been made by poorer countries is unsurprising, but China and India stand out. Together they account for almost 40 percent of the growth in global prosperity over the past decade. Combining the world's largest population with some of the fastest economic development in recent memory, China has lifted a large share of its population out of poverty and into prosperity. In doing so, it accounted for 19 percent of the growth in global prosperity over the past decade. This is due to China's move towards economic liberalisation and global economic integration. Similarly, India, home to the world's second largest population, has liberalised and globalised its economy, moving more and more people from poverty to prosperity. 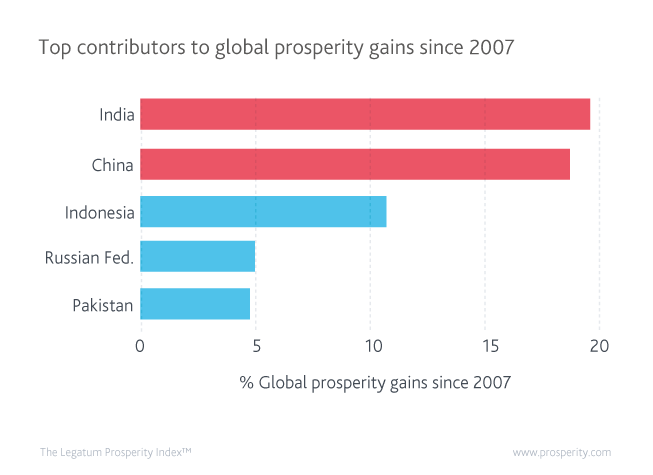 India's prosperity growth accounted for 20 percent of the growth in global prosperity over the past decade. India and China have developed very different prosperity profiles, and both face problems. China's Governance and Personal Freedom performance is weak. India, the world's largest democracy, faces different problems, namely in Education and Health. This explains why both still have some way to go to reach European or American prosperity levels. Still, their progress to date is responsible for much of the improvement in prosperity the world has seen. The countries within Asia-Pacific have the broadest spread of prosperity – New Zealand sits at number two and Afghanistan at 146.